There is speculation that Nigerian preacher TB Joshua is heading towards Zimbabwe in a few weeks’ time.The rumours came after TB Joshua at the weekend stated he will soon visit a certain “troubled country” and meet its president. He however did not specify which country. The speculation also comes amid reports that TB Joshua was recently in the process of acquiring land in Ruwa to open a church branch in Zimbabwe. The Synagogue Church of All Nations sent proposals to Ruwa Town Board seeking to buy land. TB Joshua rose to fame after accurately predicting the death of Malawi’s former ruler Bingu wa Mutharika. Social networks were flooded with rumours over the alleged visit to the country which is one of the most troubled countries in Africa with political instability, corruption, and violence. President Mugabe’s spokesperson George Charamba however was quoted yesterday stating that he was not aware of TB Joshua’s planned visit to Zimbabwe. He then suggested it was probably the MDC-T that was bringing TB Joshua to Zimbabwe. “It’s the MDC-T that’s bringing him. You think we don’t know? Check with them,” said Charamba.MDC-T organising secretary Nelson Chamisa, however, dismissed the claims saying he was in the dark about such plans. Sources, have said prior to the Sunday announcement, there was already word making the rounds about TB Joshua’s planned Zimbabwe visit. Another source said she understood the inclusive government was trying to bring TB Joshua to Zimbabwe for a prayer meeting. “I am told that he was invited by the GNU. They were trying to invite him for a combined prayer meeting so if they are denying it, probably the negotiations failed because I don’t see (President) Mugabe agreeing to something like that,” she said. 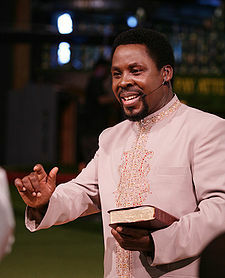 Scores of well-to-do Zimbabweans have recently visited TB Joshua’s church in Nigeria. Tsvangirai was there two years ago reportedly to seek spiritual guidance. In the same year, former Marondera West Zanu PF MP Tracy Mutinhiri and Zanu PF Politburo member and Women’s League boss Oppah Muchinguri also visited the church. Zimbabwe Football Association president Cuthbert Dube, formerly wheel-chair bound, is now able to walk after attending one of Scoan’s healing sessions. TB Joshua early this year foretold the imminent death of an ageing African leader, an oracle that apparently came true with the sudden death of Malawi President Bingu wa Mutharika. TB Joshua has also predicted the death of pop star Michael Jackson, the resignation of Pakistan’s former President Pervez Musharraf and election of Ghanaian President John Atta-Mills. He also prophesied the fall from grace of Cote d’Ivoire President Laurent Gbagbo and Ivory Coast football team’s defeat by Zambia in this year’s Africa Cup of Nations final in Gabon.